Presenting Glimpse by Kendra Leighton. Seven years ago Liz lost her mother and ten years' worth of memories. When she inherits the infamous Highwayman Inn, she hopes the move will be a fresh start. Then she meets Zachary. Zachary who haunts her by night and in dreams; who makes her question everything she is and wants to be; who seems scarcely real - yet makes her feel so alive. Inspired by Alfred Noyes' classic poem 'The Highwayman', Glimpse is a ghost story, a love story, and a story of a girl fighting for her future by confronting her terrible past. Based on the famous poem The Highwayman by Alfred Noyes, Kendra Leighton brings forth a commendable and altogether predictable but a soul searing, Gothic romance in Glimpse. I am by no means a poet neither do I have much interest in the subject but the Noyes' Highwayman is definitely one of my favorites and I liked how Leighton didn't go word for word on it but created a beautiful tale out of it. After the terrible accident where she looses her mother and also her memory, Liz has her work cut out for her. As she inherits the old Highwayman Inn and tries to confront the past and tries to piece together her life she had and make sense of the glimpses she sees. Liz is a very relatable character. Jaded by her situation. Bullied by school mates and by the glimpses she sees. Reserved and cautious after she moves with her father to the Inn and starts to see the truth for what it really was. Of course, the spirits deserve a mention too. Ghostly, gory, haunting, sometimes vengeful and some very good. Pointedly Ann, the jealous vengeful one and Zachary, who just wants to find his true love. 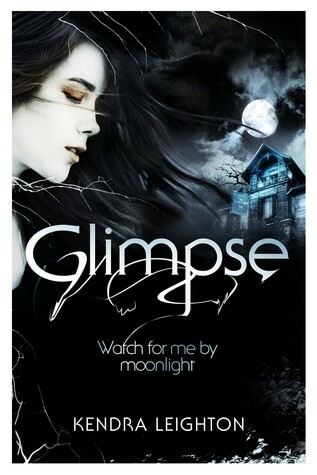 Kendra Leighton's Glimpse gives us a glimpse into an old school paranormal romance. Its heartfelt, elegant, simply brilliant and very very predictable but a story that stands on its own two feet at the end of the day. Thats what matters and I loved every second of it. "An authentic YA portrayal of Alfred Noyes' 'The Highwayman'"
It's been so long since I read something remotely Gothic-- and this sounds amazing just from it being based on The Highwayman..